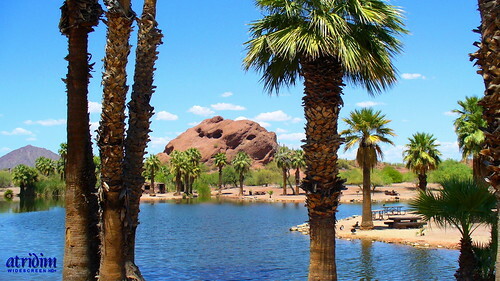 Papago Park, Phoenix, Arizona, originally uploaded by atridim. The recent GDP estimate of 1.6% growth is anemic. It sounds an alarm that the unemployment rate will be on the rise. I predict a “Double Dip Recession” and this will be a “Lost Decade”. The broadest gage of our economy is the GDP (Gross Domestic Product) Growth Rate. It is calculated every quarter by Uncle Sam. It captures the total value of all US goods and services. REAL GROWTH: A GDP growth rate above 3% reduces unemployment (light shaded upper band on chart in the link below). A GDP growth rate of 5% for 4 quarters is needed to reduce the US Unemployment Rate by 1%. ANEMIC GROWTH: A GDP growth rate of 0%-3% increases unemployment (darker shaded middle band on chart in link below). In this area, our economy can not provide enough new jobs to keep up with new graduates entering the workforce. RECESSION: A GDP growth rate below 0% for 2 or more quarters (lighter shaded lower band on the chart in link below). DEPRESSION: A GDP growth rate below -10% for 4 or more quarters. The recent significant reduction in the estimate for the US GDP rate (1.6%) for the second quarter of 2010 is alarming. It adds fuel to the projection of a “Double Dip Recession” by many economists. What I find to be of much greater concern is the dominance of all but 3 of the past 18 quarters lying in the “Anemic Growth” or “Recession” range. That signals a very strong possibility that we are in a period that some economists refer to as a “Lost Decade”, one that has little or no real growth. Scanning the economic horizons, I see no economic engines in the US that will move the GDP growth predominantly above that 3% line any time soon. I predict that we will see a “Double Dip Recession” and this will be a “Lost Decade”.
. . . My economic perspective presented thru the eye of an engineer and a lifelong student of economics.